Leverage the time of other attorneys without the significant expense of full-time employees. As there are only 24 hours in the day, the only way to increase the legal services you provide (and therefore your profits) is by engaging other attorneys to assist you so that you can accomplish two, three, or four times as much in the same 24 hours. This is the premise underlying the old associate leverage model. However, with the burgeoning nationwide network of skilled freelance lawyers, you can add subject matter expertise to your practice when and only when you need it without adding overhead. The use of freelance lawyers brings the dated associate model into the modern world making both the hiring attorneys and the freelance lawyers more profitable. Have flexible staffing. Most attorneys’ practices ebb and flow, such that one week they need three extra attorneys to fully service their clients’ needs and the next week they only need one. By engaging freelance lawyers, attorneys can avoid: (i) missing clients’ desired (though often self-imposed) timelines; (ii) pulling all-nighters; (iii) turning down new clients; and (iv) hiring employees that find themselves without work to do in slow weeks, which are a drain on profitability, client retention, and quality of life. Move away from the billable hour. Law firm realization of standardized rates have been declining dramatically since 20072 as clients are demanding more certainty in pricing. While legal influencers often talk about this in terms of alternative fee arrangements like flat fees, this “overlooks a major shift that has occurred over the past decade: the widespread client insistence on budgets (with caps) for both transactional and litigation matters.”3 Using freelance lawyers allows attorneys to meet clients’ billing demands without negatively impacting their profit margin. For instance, if you know that you will pay a freelance attorney $1,500 to prepare a motion for summary judgment and $1,000 to prepare a reply, you can comfortably quote a flat fee for motion practice, thereby meeting the client’s need for certainty without assuming the risk of nonpayment. Firms are using contract lawyers, staff lawyers and part-time lawyers in an effort to mitigate costs and improve efficiency and profitability. The stigma about the quality of contract lawyer work is gone in most firms, in our experience, and clients find such strategies to be acceptable if not preferable. Half of all law firms in the 2017 survey said they have significantly changed their staffing strategy since the recession. The use of contract lawyers is the top staffing tactic firms are pursing and the most effective lawyer staffing technique…. The use of contract lawyers allows firms to flex up and down in response to demand fluctuations without increasing overhead. A firm that has addressed the issue of underperformance and identified a cohesive and productive core partnership should certainly add contract lawyers to its toolkit if it has not already done so. So How Do I Grow My Business and Profits Using Freelance Lawyers? Scenario 1: Associates are expensive. And, all too often, once you spend a year training them, they leave to hang up their own shingle or join a higher paying firm. The harsh result – another attorney benefits from your countless hours of training and you are left high and dry to figure out how to handle the work you had previously delegated to your not-so-faithful associate. Scenario 2: You have not yet hired an associate, because you are leery of the reality of the roller coaster of the practice of law – feast or famine. While every attorney prays to be blessed with a steady workflow, few can harness that unicorn. So, instead, you find yourself working all day, every day, missing friend’s birthdays and kids’ recitals, and then panicking when you actually have a minute to breath because you fear the next client may not come in the door. There is a better solution! By engaging freelance lawyers on a project basis, attorneys can obtain the subject matter expertise on a project by project basis at the flat fee price they set without increasing overhead. Here are a few examples of how attorneys on LAWCLERK have priced and billed projects completed by skilled freelance lawyers, resulting in a better work product, a lower cost to their clients, and a greater profit for the attorneys. Example 1 – Cultivate a Team of Freelancers to Increase Efficiencies and Profits. 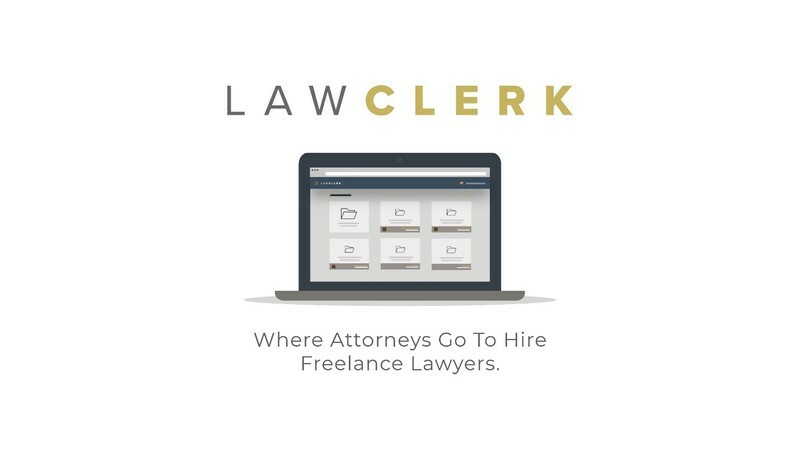 Two attorneys using LAWCLERK shared with us that after cycling through numerous associates, they now only use freelance lawyers on LAWCLERK. They have found an abundance of freelance lawyers skilled in their specialized practice areas, so they always have someone available to assist them on the timeframe they need at a price point that is less than the full-time associates they previously employed before joining LAWCLERK. After only a few months, they cultivated more than ten freelance lawyers that understand the nuances of their practices and their writing styles, such that they effectively have ten associates without the significant expense of even one full-time employee. And, they have streamlined sharing the important facts of their clients’ cases with their hired freelancers by recording their client meetings and uploading the audio files to LAWCLERK’s secured document library, thereby maximizing profits through efficiency. Example 2 – Take More Cases and Provide Greater Access to Justice. All too often attorneys turn down cases at the initial consult because they believe the cost of legal services may exceed the ultimate damages resulting in a lose-lose situation for both the client and the attorney. But, savvy attorneys have used LAWCLERK to solve this problem and provide greater access to justice. By way of example, a client with a potentially small matter may agree to pay a $500 consult fee for an hour with the attorney. To ensure that the attorney makes a profit while still providing important legal advice to a client on a small matter, the attorney has their intake staff take a thorough description of the issue. Then, before the client meeting, at which the client has agreed to pay a $500 consult fee, the attorney posts the legal research issue on LAWCLERK to obtain a detailed memorandum on the issue. By posting the memorandum to LAWCLERK at $300 and charging an initial consult fee of $500, the attorney makes a $200 profit on the 45-minute client meeting. And, the best part, the client receives substantive legal advice during the initial consult to better evaluate her case, thereby enabling attorneys to provide greater access to justice for all, without losing money. Having received 50 interrogatories, the attorney sends the interrogatory responses to the client to answer. The client provides her written answers to the attorney who then posts a project for a freelance lawyer to review the client responses and formalize them with proper state-specific objections for $250. Having received a document dump, attorneys have posted document review projects of between 5,000 and +100,000 pages to obtain summaries of the documents and/or to identify the key documents that the attorney needs to closely review. Example 4 – Make Appeals More Affordable. Judges and juries are not infallible. How often have you received a decision and believed that your client had at least a 50% chance of reversal on appeal? When this arises, clients face the difficult decision of accepting the judgment with its perceived defects or spending more money and possibly ending up with an affirmance. For many clients, the decision to appeal ends up being an issue of dollars and cents. For instance, if an appeal would only cost $10,000, the client would be willing to spend the money and seek a reversal, but if an appeal will cost $25,000, the client is not able or willing to take on the appeal. Historically, attorneys have then faced the difficult decision of whether they are willing to cut their fees (i.e. their profit) in order to take a meritorious appeal or allow a bad decision to stand. But this does not have to be the case. LAWCLERK provides a better alternative. By using freelance lawyers through the LAWCLERK marketplace, attorneys (and therefore their clients) can have certainty in the costs of an appeal and can agree to accept appeals without significant risk to their profit margins. Thus, with LAWCLERK, attorneys can improve access to justice, while still making a profit. It is a win–win. Is Outsourcing to Freelance Lawyers on LAWCLERK Ethically Compliant? The answer is unequivocally “yes!” LAWCLERK is built by attorneys for attorneys and we understand the ethical restrictions placed on you. We are the only freelance marketplace that is designed to comply with every state’s ethical rules. While you can read our 50-state survey at https://www.lawclerk.legal/ethics_whitepaper, the punchline is that the freelance lawyers on LAWCLERK work in a paraprofessional capacity for the hiring attorney, thereby allowing attorneys to harness the skill and knowledge of freelance lawyers from across the country. I am a duly licensed attorney in good-standing and I agree to fully comply with the following rules regarding the use of LAWCLERK. 1. I shall have sole professional responsibility for the work product of the Lawclerk. 2. I will supervise the Lawclerk’s performance of services on the assigned project to ensure compliance with the applicable Rules of Professional Conduct. 3. I will establish and maintain the relationship with my client. 4. The Lawclerk shall have no contact with my client, including without limitation no email, telephone, skype, web, social media, or in-person contact. 5. The Lawclerk shall not appear in court or any other judicial or administrative body on behalf of my client. 6. I will not ask or otherwise cause the Lawclerk to serve or otherwise disseminate the Lawclerk’s work product or any other documents to anyone other than me. 7. I will not ask or otherwise cause the Lawclerk to sign or file any documents with any court or administrative body. 8. The Lawclerk shall have no contact with opposing counsel, witnesses, or other persons potentially involved in the project for which the Lawclerk has been engaged, including without limitation no email, telephone, skype, web, social media, or in-person contact. 9. If required by my engagement agreement with my client or applicable law, I have obtained my client’s consent to utilize the services of a Lawclerk. 10. I have sole responsibility for determining the fee charged to my client for legal services. The Lawclerk shall not have any involvement in determining the fee I charge my client for the Lawclerk’s services. 11. All payment for Lawclerk services shall be completed through www.lawclerk.legal. The attorney establishes the flat fee price for the project, which is not contingent upon the outcome of the attorney’s case or matter. The Lawclerk will have no involvement in determining the fees charged by an attorney to his/her clients. The Lawclerk shall hold a Juris Doctorate from an ABA accredited law school or be barred and in good standing in the Lawclerk’s jurisdiction and his/her services shall solely be offered to attorneys (not the public). The attorneys shall be properly admitted and in good standing within their applicable jurisdiction(s). Disbarred or suspended lawyers may not serve as Lawclerks. LAWCLERK will maintain a list of all of the attorney’s clients for which the Lawclerk has been engaged through LAWCLERK and will remove from the available list of Lawclerks any Lawclerk that has a conflict as a result of prior work performed through LAWCLERK. For each project in which a Lawclerk is engaged by an attorney, the Lawclerk shall: (i) complete a conflict check and review the applicable state’s conflict laws and affirm that he or she does not have any conflict and may complete the project; and (ii) execute a confidentiality and non-disclosure agreement. LAWCLERK does not permit attorneys from Indiana to engage Lawclerks because of Indiana’s unique guidelines to its rules regarding contract paraprofessionals. LAWCLERK thereby requires that the attorney agree to remain solely responsible for the attorney-client relationship and the legal advice provided by the attorney to his/her client. Thus, while the attorney may obtain a legal memorandum, a draft pleading, or other legal services from a Lawclerk, the Lawclerk will have no direct contact with the attorney’s client, the Lawclerk will be supervised by the attorney, and the attorney will retain sole responsibility for the Lawclerk’s work product and the attorney’s ultimate use of such work product. Supervision designed to ensure that nonlawyers do not provide legal advice or otherwise violate the Rules of Professional Conduct is the key to Model Rule 5.3. By precluding any contact with an attorney’s clients, opposing counsel, witnesses, or any other party to the project for which the Lawclerk has been engaged, LAWCLERK eliminates the greatest concern addressed by Model Rule 5.3. LAWCLERK also requires, as more fully set forth above, conflict checks, an acknowledgment that the Lawclerk has reviewed and will comply with the applicable state’s Rules of Professional Conduct, an agreement by the attorney to supervise the Lawclerk, and an acknowledgement by the attorney that s/he is solely responsible for the Lawclerk’s work product. These restrictions and requirements are designed to satisfy not only the actual text of Model Rule 5.3, but the policy behind it. A lawyer may use nonlawyers outside the firm to assist the lawyer in rendering legal services to the client. Examples include the retention of an investigative or paraprofessional service, hiring a document management company to create and maintain a database for complex litigation, sending client documents to a third party for printing or scanning, and using an Internet-based service to store client information. When using such services outside the firm, a lawyer must make reasonable efforts to ensure that the services are provided in a manner that is compatible with the lawyer’s professional obligations. The extent of this obligation will depend upon the circumstances, including the education, experience and reputation of the nonlawyer; the nature of the services involved; the terms of any arrangements concerning the protection of client information; and the legal and ethical environments of the jurisdictions in which the services will be performed, particularly with regard to confidentiality. See also Rules 1.1 (competence), 1.2 (allocation of authority), 1.4 (communication with client), 1.6 (confidentiality), 5.4(a) (professional independence of the lawyer), and 5.5(a) (unauthorized practice of law). When retaining or directing a nonlawyer outside the firm, a lawyer should communicate directions appropriate under the circumstances to give reasonable assurance that the nonlawyer’s conduct is compatible with the professional obligations of the lawyer. Similar to the analysis under Model Rule 5.3, as the attorney has sole responsibility for the Lawclerk’s work product and the Lawclerk is precluded from having any contact with an attorney’s clients, opposing counsel, witnesses, or any other party to the project for which the Lawclerk has been engaged, the Lawclerk is precluded from providing legal advice to an attorney’s client, thereby satisfying both the requirements imposed in Model Rule 5.3, as well as the policy behind the rule. Thus, by using LAWCLERK, an attorney can benefit from the skill and written work of a +20-year attorney from another state without running afoul of the prohibition on the unauthorized practice of law. The functions of an unlicensed law clerk should be limited to work of a preparatory nature, such as research, investigation of details, assemblage of data, and like work that will enable the attorney/employer to carry a given matter to a conclusion through his or her own examination, approval, or additional effort; the activities of a law clerk do not constitute the practice of law so long as they are thus limited. [footnote omitted] On the other hand, an unlicensed law clerk who engages in activities requiring legal knowledge or training, such as handling probate matters, examination of abstract titles, and preparation of wills, leases, mortgages, bills of sales, or contracts, without supervision from his or her employer, thereby engages in the unauthorized practice of law. Consistent with the foregoing legal authorities and guidelines, LAWCLERK requires the attorney to supervise the Lawclerk and to maintain responsibility for the Lawclerk’s work product. However, LAWCLERK is far more restrictive than the foregoing guidelines for paralegals, law clerks, and legal assistants and more protective of the public as it precludes Lawclerks from engaging in any contact with clients, opposing counsel, witnesses, or any other party to the project for which the Lawclerk has been engaged. Thus, by using LAWCLERK, you can take advantage of LAWCLERK’s nationwide network of skilled freelance lawyers and grow and improve your practice while being compliant with the prohibition on the unauthorized practice of law. In 2008, the U.S. Supreme Court revisited the issue addressing whether the Equal Access to Justice Act, 5 U.S.C. § 504(a)(l), and 28 U.S.C. § 2412(d)(1)(A) allows a prevailing party in a case brought by or against the government to recover fees for paralegal services at market rates or only at the attorney’s cost for such paraprofessional services.30 In determining that paralegal services may be recovered at prevailing market rates, the Court rejected the contention that the statutes’ varying use of the words “expenses” and “fees” changed the analysis. The Court explained that even if it agreed that the statutes referred to reasonable costs, one does not determine the reasonable cost of an engineering report from the perspective of what the engineering firm pays the engineer preparing the report. Similarly, one does not determine the reasonable cost of paraprofessional services from the perspective of what the attorney pays the paraprofessional. Rather, the reasonable cost is determined by what expense is incurred by the client.31 “It seems more plausible that Congress intended all ‘fees and other expenses’ to be recoverable at the litigant’s ‘reasonable cost,’ subject to the proviso that ‘reasonable cost’ would be deemed to be ‘prevailing market rates’ when such rates could be determined.”32Thus, whether the term “fees,” “expenses,” or “costs” is utilized in connection with paraprofessionals services, the analysis remains the same –paraprofessional services may be reimbursed at prevailing market rates not the cost paid by the attorney to the paraprofessional. The determination of a proper fee requires consideration of the interests of both client and lawyer. A lawyer should not charge more than a reasonable fee, for excessive cost of legal service would deter laymen from utilizing the legal system in protection of their rights. Furthermore, an excessive charge abuses the professional relationship between lawyer and client. On the other hand, adequate compensation is necessary in order to enable the lawyer to serve his client effectively and to preserve the integrity and independence of the profession. In its Formal Opinion 00-420, the ABA Standing Committee on Ethics and Professional Responsibility directly addressed the question of whether contract lawyers’ services must be billed to the client at the rate paid to the contract lawyer or at prevailing market rates.34 The answer – yes, attorneys may bill the services of contract lawyers to their clients at prevailing market rates as long as the rates satisfy Model Rule 1.5(a)’s reasonableness requirement. Subject to the Rule 1.5(a) mandate that ‘a lawyers fee shall be reasonable,’ a lawyer may, under the Model Rules, add a surcharge on amounts paid to a contract lawyer when services provided by the contract lawyer are billed as legal services. This is true whether the use and role of the contract lawyer are or are not disclosed to the client. The addition of a surcharge above cost does not require disclosure to the client in this circumstance, even when communication about fees is required under Rule 1.5(b). If the costs associated with contracting counsel’s services are billed as an expense, they should not be greater than the actual cost incurred, plus those costs that are associated directly with the provision of services, unless there has been a specific agreement with the client otherwise. In Formal Opinion No. 00-420, we concluded that a law firm that engaged a contract lawyer could add a surcharge to the cost paid by the billing lawyer provided the total charge represented a reasonable fee for the services provided to the client. This is not substantively different from the manner in which a conventional law firm bills for the services of its lawyers. The firm pays a lawyer a salary, provides him with employment benefits, incurs office space and other overhead costs to support him, and also earns a profit from his services; the client generally is not informed of the details of the financial relationship between the law firm and the lawyer. Likewise, the lawyer is not obligated to inform the client how much the firm is paying a contract lawyer; the restraint is the overarching requirement that the fee charged for the services not be unreasonable. If the firm decides to pass those costs through to the client as a disbursement, however, no markup is permitted. In the absence of an agreement with the client authorizing a greater charge, the lawyer may bill the client only its actual cost plus a reasonable allocation of associated overhead, such as the amount the lawyer spent on any office space, support staff, equipment, and supplies for the individuals under contract. The analysis is no different for other outsourced legal services, except that the overhead costs associated with the provision of such services may be minimal or nonexistent if and to the extent that the outsourced work is performed off-site without the need for infrastructural support. Thus, the U.S. Supreme Court, the Model Rules, and the ABA Standing Committee on Ethics and Professional Responsibility have confirmed that attorneys can bill their clients for freelance lawyers’ services, irrespective of whether the lawyer is acting in a paraprofessional capacity, as long as the rate is a reasonable fee consistent with prevailing market rates and disclosed to the client. and one of our LAWCLERK Care Team Members will happily answer any questions, help you sign-up, or post a project. 1 Georgetown Law Center for the Study of the Legal Profession and Thomson Reuters, 2017 Report on the State of the Legal Market (Jan. 12, 2017), p. 17, available at http://legalsolutions.thomsonreuters.com/law-products/solutions/peer-monitor/complimentary-reports. 2 Georgetown Law Center for the Study of the Legal Profession and Thomson Reuters, 2018 Report on the State of the Legal Market (Jan. 10, 2018), p. 18, available at http://www.legalexecutiveinstitute.com/2018-legal-market-report/. 3 Id. at p. 10. 4 Thomas S. Clay and Eric A. Seeger, 2017 Law Firms in Transition, an Altman Weil Flash Survey (May 2017), available at www.altmanweil.com/LFiT2017. 5 Id. at p. iii. 6 Id. at p. 33. 8 Id. at p. 26. 9 Id. at p. 57. 10 See Model Rules Comment 5.5(2). 12 The date of adoption can be found at: http://www.americanbar.org/groups/professional_responsibility/publications/model_rules_of_professional_conduct/alpha_list_state_adopting_model_rules.html. 13 The American Bar Association’s (the “ABA”) comparison of Model Rule 5.3 to each state’s adopted form of Model Rule 5.3 as of September 15, 2016 can be found at https://www.americanbar.org/content/dam/aba/administrative/professional_responsibility/mrpc_5_3.authcheckdam.pdf. The ABA’s comparison of Model Rule 5.5 to each state’s form of Model Rule 5.5 as of September 15, 2016 can be found at: https://www.americanbar.org/content/dam/aba/administrative/professional_responsibility/recommendations.authcheckdam.pdf. 14 See Model Rules Comment 5.5(2). 15 See Model Rules Comment 5.3(3). 17 7 Am. Jur. 2d Attorneys at Law § 130 (emphasis added). 18 NALA Code, available at https://www.nala.org/sites/default/files/codeofethics.pdf; see also NULA Guidelines, available at https://www.nala.org/sites/default/files/modelstandards.pdf. 19 NALA Guideline No. 2; NALA Code Canon 2. 20 See NALA Code Canons 2 and 3; NALA Guidelines 2 and 3. 21 See NALA Code Canon 4; see also 122 Am. Jur. Proof of Facts 3d § 279. 22 See ABA Guidelines, at Preamble and n. 1, available at https://apps.americanbar.org/legalservices/paralegals/downloads/modelguidelines.pdf. 23 See id. at Guideline No. 2 (emphasis added). 24 See id. at Guideline No. 3. 25 See id. at Comment to Guideline No. 2. 26 See Missouri v. Jenkins, 491 U.S. 274 (1989). 27 See Richlin v. Chertoff, 553 U.S. 571, 570 (2008); see also Missouri v. Jenkins, 491 U.S. 274 (1989). 28 See Missouri, 491 U.S. at 287. 30 Richlin v. Chertoff, 553 U.S. 571 (2008). 31 See id. at 579. 32 See id. at 579-580. 33 ABA Comm. On Ethics and Prof’ Responsibility Formal Op. 93-379 (Dec. 6, 1993) (Billing for Professional Fees, Disbursements and Other Expenses). 34 ABA Comm. On Ethics and Prof’ Responsibility Formal Op. 00-420 (Nov. 29, 2000) (Surcharge to Client for Use of a Contract Lawyer). 35 ABA Comm. On Ethics and Prof’ Responsibility Formal Op. 08-451 (Aug. 5, 2008) (Lawyer’s Obligations When Outsourcing Legal and Nonlegal Support Services).